This is for today's Ways To Use It Challenge to go green! We could either use the color green, or use recycled materials. 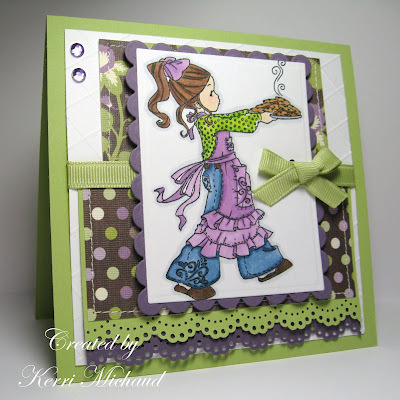 I decided to use the color green for my version : ) I used Whiff of Joy~Willow Baking Cookies as my image. I colored her with Copics to coordinate with my dp from DCWV Latte Matstack. I put some score lines on the white panel using my Scor-Pal, and added some stitching around the dp panels. I added the lacey border which reminded me of her apron, so I kind of tried to make the dp panels look like an apron. What do you think? Love it! She is adorable and I love all the colors and layers. You do such a great job with the copics. Ooohhh...those are right at the top of my wish list!!! Don't you just love that stack? Such great colors! What a precious girl...Your coloring matching the emellies...really girl...this is beautiful!! This is really good. I like the lacy edges, and they do look like her apron! She turned out adorable.